Google, Facebook, Yelp, Trip Advisor, Zillow, Trulia, ZocDoc, OpenTable, Avvo (just to name a few). How do you maintain them all? With review distribution. Multiple Business Profiles? No Problem! 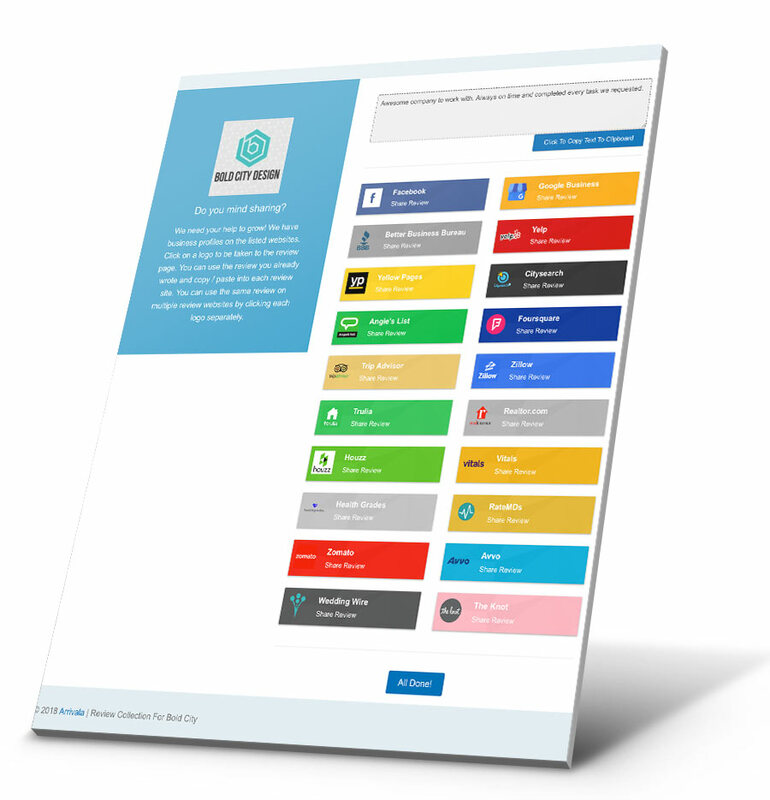 The average business has profiles on 5 platforms that enable review collection. However, over 75% of those profiles appear neglected due to a lack of reviews being published. It's understandable why. 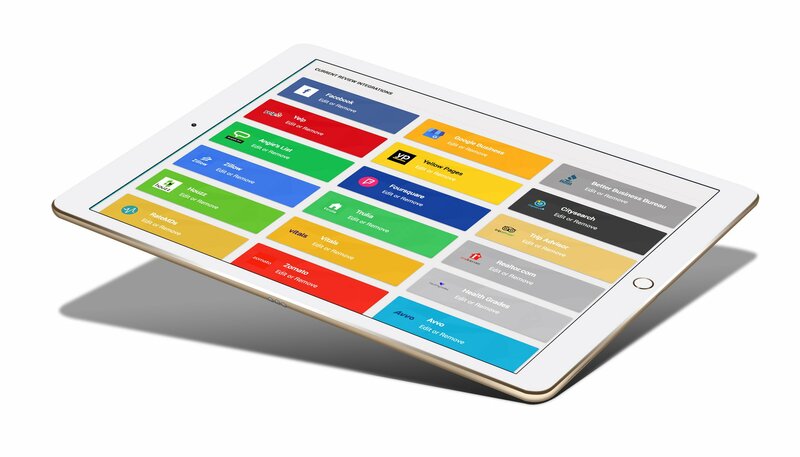 It's hard enough collecting reviews for one platform, how are you expected manage them all? Simple, Arrivala review distribution. When we collect reviews from your clients or customers, we give them a simple two-click process to post the same review across all of your review platforms. They simply copy, paste and submit. You no longer need to send your customer or client links to multiple review platforms and hope they complete at least one. 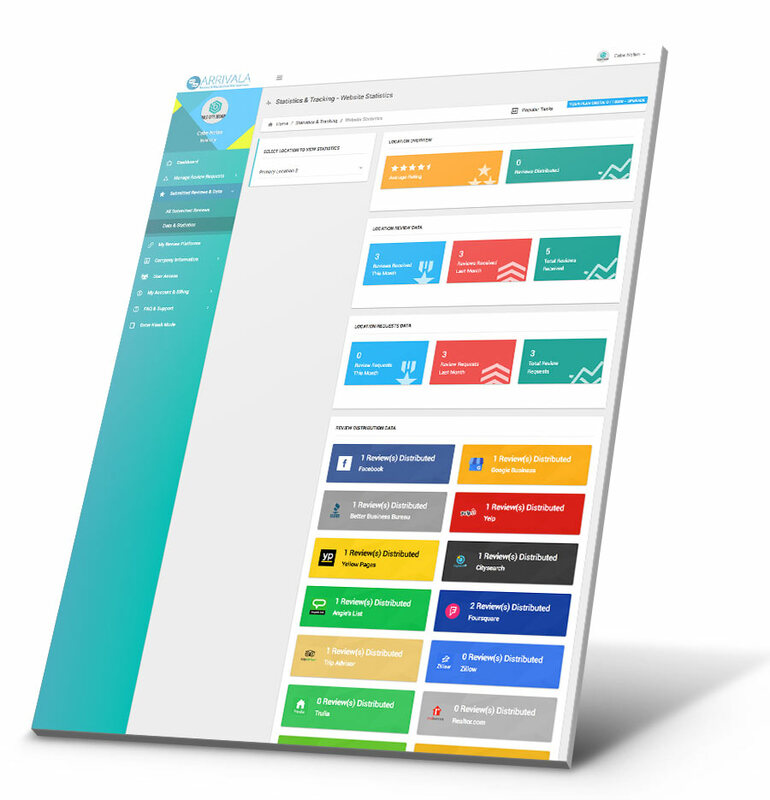 Give yourself a 5-star rating across all of your business profiles without the complexities that typically go along with multi-platform review collection. For each business location (or sales agent) add your business review platforms where reviews are accepted. This process takes minutes to complete since Arrivala takes care of all the formatting for you. Once your platforms are added, you're ready to start sending review requests. Add clients & customers who you would like to collect business reviews from. Arrivala will automatically send them emails or text messages based on your defined schedule. If a customer submits a positive review, they are automatically recommended to post their review on your platforms. Arrivala works by filtering through positive and negative reviews. 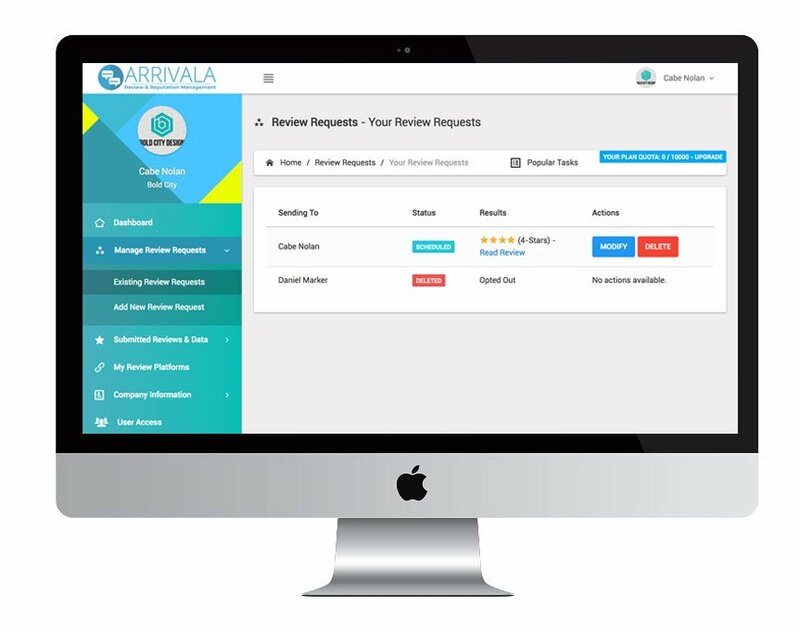 If the customers review is positive, Arrivala automatically helps to distribute that review to your review platforms by showing your available profiles. The reviewer is presented with a quick & easy two-click process to copy/paste their review to these third parties. You can sit back knowing that Arrivala is working around the clock to filter and distribute your reviews and grow your positive reputation online. It's important to know what's working and what's not. Arrivala provides easy to read statistics on where reviews are being successfully distributed and what are your top performing profiles. Use this information in your marketing plan to promote profiles that are receiving the most positive attention. Knowledge and data is power!